The fresh water that flows through rocks and open spaces below the Earth’s surface is known in environmental science as groundwater. Most of the fresh water that people access is groundwater, flowing underground. Unconfined aquifers: Water in an unconfined aquifer is stored in permeable rocks and sediment through which it can flow freely. Hence, water in this type of aquifer can flow to plant roots or bubble up to the surface as a spring. The water table is the boundary between the water-filled rock and sediment of an aquifer and the dry rock and sediment above it. Water that seeps into the ground through the water table when it rains, refills, or recharges, the groundwater in unconfined aquifers. 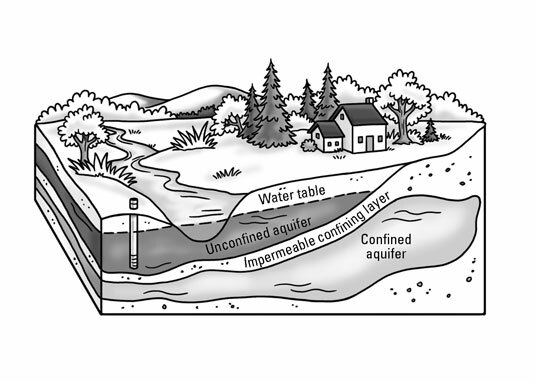 Confined aquifers: Confined aquifers are surrounded by impermeable layers of rock that don’t allow water to move through them. Thus, confined aquifers create underground storage containers for the water they contain. Because impermeable rock layers surround confined aquifers, they have a specific area of recharge, where fresh water from rainfall can enter and refill the aquifer. To withdraw groundwater stored in both types of aquifers, people dig wells. Unfortunately, the rate of recharge for most groundwater aquifers is much slower than the rate of withdrawal through wells to meet human water needs. As a result, many existing wells are now dry wells, where no more water can be drawn, and cones of depression form in the water table. 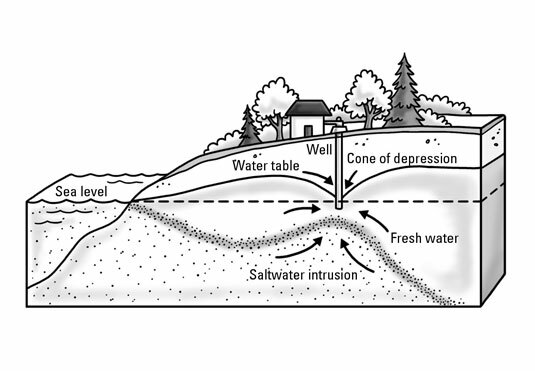 A cone of depression is an area where the water table dips because water has been withdrawn from that area of the aquifer faster than it could be recharged. Withdrawing groundwater from aquifers faster than it can be recharged can result in saltwater intrusions in coastal regions, where fresh water underground contacts the salt water of the ocean nearby. When a cone of depression occurs, the space created by the withdrawal of fresh water may fill up with salt water rather than fresh groundwater, hence the name saltwater intrusion. This figure shows both a cone of depression and a saltwater intrusion. After salt water has intruded into an aquifer, the aquifer is no longer a source of fresh water for the people and ecosystems that depend on it.